In the last few years, we’ve been seeing lots of different materials being used for skateboards and longboards. These typically range from carbon fiber to fiberglass to bamboo and even some plastics. 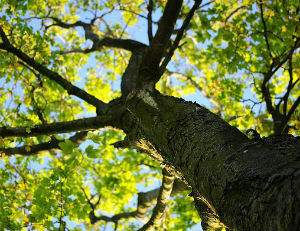 These materials make good alternatives for traditional maple and are often cheaper, longer lasting and in some cases more environmentally friendly. However, is it worth using/buying these alternative materials at all? In today’s article, I compare Bamboo and Maple. I talk about the advantages and disadvantages of each and what you should look at when you’re thinking about buying either. In general, Bamboo makes for lighter, stronger decks that have flex. This is perfect if you’re looking for a flexible commuter, dancer or a durable cruiser board. The Bamboo will flex and keep flexing and you won’t have to worry about any cracking. It is also a lot more environmentally friendly than Maple. Bamboo grows rapidly and quickly. 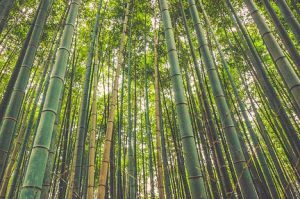 It takes 5 years for one shoot of bamboo to fully grow, whilst comparatively, it takes 30-40 years for a single tree of Maple to fully mature. This is because when Bamboo is cut, it only needs the shoot to remain so it can regrow fully, but when you cut Maple it does not regrow, it needs to replanted after the harvest. The clear winner here bamboo, it’s more environmentally friendly, matures quickly, takes fewer resources to grow and it’s a sustainable source of material. Some companies like Arbor longboards use Bamboo because of how environmentally friendly it is. Another good feature of Bamboo is how lightweight and strong it is. Thanks to this bamboo longboard decks are usually compact, flexible and lightweight. So yeah, it is possible to make flexy longboards that can support up to 200lbs of weight from only 5plys of Bamboo. But with all these advantages, Bamboo will cost slightly more than traditional maple. 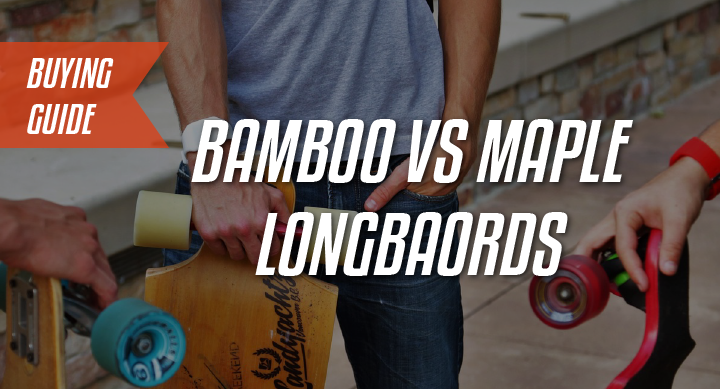 Be prepared to pay slightly more for if you want a Bamboo longboard, but it doesn’t mean they aren’t affordable. Check out the pricing of an affordable Quest Bamboo complete on Amazon.com. Maple, in general, is stiffer and makes for better stiff decks. This is perfect if you’re looking for a skateboard, a downhill longboard or simply something that is sturdier with minimal flex. For example, take a look at this Maple board from Sector 9 on Amazon.com. However, it doesn’t mean you can’t have a flexy Maple board. A lot of people say Bamboo is better than Maple, but it all really depends where the Maple you’re comparing it with is grown. Not all maple is the same and maple grown in different places have different properties. For example, there are differences in density and fiber growth for Maple grown in Siberia vs Maple grown in Canada. This is because the Maple trees in Canada grow at a higher elevation and thusly have denser fibers than those in Siberia. So, this directly translates to them being stronger, stiffer and more durable, meaning they will make better skateboards and longboards. So in summary, against cheap Maple, Bamboo wins, but against American Maple, Bamboo loses. However, when it comes to being flexible and strong, Bamboo is better than Maple. So when we consider the environment, using Maple is not so good. This is because skateboarding is one of the biggest contributors to Maple deforestation in North America. Maple isn’t easy to replace and it takes a long time to grow so it’s not great when trees are cut down. However, Maple can be sourced if it is taken from responsibly managed reserves and forests, some of the best longboard companies do this. This means even though Maple is cut down there are systems in place to limit the impact to the environment. Also, when you buy Maple you are supporting the American industry. This is important because you are stimulating the economy and support local business. Bamboo isn’t as durable as Maple. When it is fresh, it really retains its flex well and is strong. But the older it gets (after a few years), it becomes less flexy and starts sagging a little bit. This means it won’t ride or perform as well as it once did. So definitely some years down the line, you’ll be looking to replace your Bamboo longboard. On the other hand, Maple is a bit more durable because it is denser and stiffer. It will last longer in general but will still need to be replaced after a few years. Neither of them will break easily, but cheap Maple will be vulnerable to that. Which one is the best for cruising? When it comes to cruising, it is totally dependant on the board you want to get. As I mentioned, Bamboo is flexible. This flexibility will act as suspension and smoothen out a lot of road vibration for a more comfortable ride. However, you can’t get Bamboo in some deck shapes. It has trouble holding the mold and they can‘t make drop down longboard shapes. You are limited to top mounts and drop through decks. Check out the Arbor Zeppelin on Amazon.com for an example of a good Bamboo cruiser. Now Maple is stiffer. This stiffness is good because you’ll get more feedback from the road. If you want something more responsive and that allows you really feel in control and really ‘feel’ your trucks, you should go for a Maple cruiser. You will also have a lot more options to choose from in terms of deck shapes. So in summary, it is difficult to say if there is a clear winner. But definitely, Bamboo longboards and skateboards are better than maple boards when you look at it in terms of the environment. However, when it comes to durability, performance, and cost, American made maple skateboards are far better than Bamboo boards. In the end, it really comes down to is personal preference and the longboard type you want.